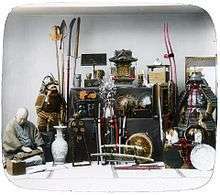 The military history of Japan is characterized by a period of clan warfare that lasted until the 12th century AD. This was followed by feudal wars that culminated in military governments known as "Shogunate". Feudal militarism transitioned to Imperial militarism in the 19th century after the landings of Admiral Perry and the elevation of the Meiji Emperor. This led to rampant imperialism until Japan's defeat by the Allies in World War II. The Occupation of Japan marks the inception of modern Japanese military history with the drafting of a new Constitution, prohibiting the ability to wage war against other nations. Recent archaeological research has uncovered traces of wars as far back as the Jōmon period (ca. 10,000–300 BC) between the various tribes existing on the Japanese Archipelago. Some theorists believe that shortly after the Yayoi period (ca. 300 BC – 250 AD), horse riders from the Korean Peninsula invaded southern Kyūshū, then spread to northern Honshū. At this time, horse-riding and iron tools were first introduced to the islands. Near the end of the Jōmon period (ca. 300 BC), villages and towns became surrounded by moats and wooden fences due to increasing violence within or between communities. Some remains were found with head and arrow injuries. Battles were fought with weapons like the sword, sling, spear, and bow and arrow. Bronze goods and bronze-making techniques from the Asian mainland reached what is now Japan as early as the 3rd century BC. It is believed that bronze and later iron implements, and weapons were introduced to Japan near the end of this time (and well into the early Yamato period). Archaeological findings suggest that bronze and iron weapons were not used for war until later, particularly at the beginning of the Yamato period, as the metal weapons found from the remains do not show wear consistent with use as weapons. The transition from the Jōmon to Yayoi, and later to the Yamato period, is likely to have been characterized by violent struggle as the natives were soon displaced by the invaders and their vastly superior military technology. Historian John Kuehn believes that a possible "partial genocide" of Japan's aboriginal people occurred during this period. Around this time, San Guo Zhi first refer to the nation of "Wa (Japan)". According to this work, Wa was "divided into more than 100 tribes", and for some 70 or 80 years there were many disturbances and warfare. About 30 of the communities had been united by a sorceress-queen named Himiko. She sent an emissary named Nashime (ja:難升米, Nashonmi in Chinese) with a tribute of slaves and cloth to Daifang in China, establishing diplomatic relations with Cao Wei (the Chinese kingdom of Wei). Iron helmet and armour with gilt bronze decoration, Kofun era, 5th century. Tokyo National Museum. By the end of the 4th century, the Yamato clan was well settled on the Nara plain with considerable control over the surrounding areas. The Five kings of Wa sent envoys to China for the dominion of the Japanese Islands. The Nihon Shoki described that Yamato was even strong enough to have sent an army against the powerful state of Goguryeo. Yamato Japan had close relations with the southwestern Korean kingdom of Baekje. In 663, Japan, supporting Baekje, was defeated by the allied forces of Tang China and Silla in Korean Peninsula (the Battle of Hakusonko). As a result, the Japanese were banished from the Korean Peninsula. To defend the Japanese Archipelago, a military base was constructed in Dazaifu, Fukuoka of Kyushu. Ancient Japan had close ties with the Gaya Confederacy in the Korean Peninsula, as well as with the Korean kingdom of Baekje. Gaya exported abundant quantities of iron armor and weapons to Wa (there was an abundance of naturally-occurring iron in that region) and there may have even been a Japanese military post there with Gaya and Baekje cooperation. In 552, the ruler of Baekje appealed to Yamato for help against its enemies, the neighboring Silla. Along with his emissaries to the Yamato court, the Baekje king sent bronze images of Buddha, some Buddhist scriptures, and a letter praising Buddhism. These gifts triggered a powerful burst of interest in Buddhism. The Battle of Baekgang (白村江) took place in 663, near the conclusion of the Korean Three Kingdoms period. The Nihon shoki records that Yamato sent 32,000 troops and 1,000 ships to support Baekje against the Silla-Tang force. However, these ships were intercepted by a Silla-Tang fleet and defeated. Baekje, without aid and surrounded by Silla and Tang forces on the land, collapsed. A hostile Silla (Silla was a rival of Baekje, and as Baekje had a close relationship with Wa Japan, Silla viewed Wa Japan also as a rival and was hostile to it) prevented Japan from having any further meaningful contact with the Korean Peninsula until far later in time. The Japanese then turned directly to China. In many ways, the Nara period was the beginning of Japanese culture becoming what we know today. It was in this period that Buddhism, the Chinese writing system, and law system first became codified in Japan. The country was unified and centralized, and much of the basics of the feudal system were later set down. 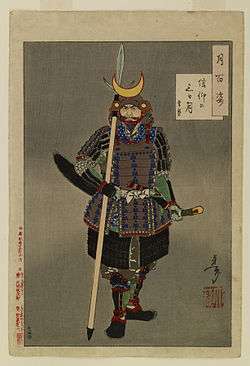 While much of the discipline, weapons, armor, and technique known of the samurai were not developed yet, the fundamentals of samurai practices had begun, as technologies of mounted archery, swordsmanship, and spear fighting were adopted. Succession disputes were prevalent here, just as in most of the later periods. The Nara period saw the appointment of the first Shogun, Ōtomo no Otomaro (大伴 弟麻呂 or 大伴 乙麻呂, 731 – June 14, 809). 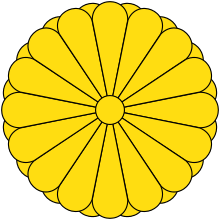 The Heian Period, militarily, consisted mainly of conflicts and battles between samurai clans over political power and influence, especially fought over control over the line of succession to the Chrysanthemum Throne. The Imperial family struggled against the control of the Fujiwara clan, which almost exclusively monopolized the post of regent (Sesshō and Kampaku). Feudal conflicts over land, political power, and influence eventually culminated in the Genpei War between the Taira and Minamoto clans, and a large number of smaller clans allied with one side or the other. The end of the Genpei War brought about the end of the Heian period and the beginning of the Kamakura period. During this period, samurai were still, largely, archers, as were before, and several swordsmen. Nearly all duels and battles began with an exchange of arrow fire, before single combat was entered, with swords and daggers. The later Heian period conflicts, particularly the Genpei War, and the establishment of the Kamakura shogunate that followed, mark the rise of the samurai class over the court nobility (kuge). Shogunates, who were essentially military governments, dominated Japanese politics for nearly seven hundred years (1185-1868), subverting the power of the Emperor and that of the Imperial Court. Militarily speaking, this period also marks a crucial shift from a state that was united in relative peace against outside threats, to one that does not fear invasion and instead, focused on internal division and clashes between ruling factions. With the exception of the Mongol invasions of the 13th century, Japan did not face considerable outside threats until the arrival of Europeans in the 16th century. Thus, pre-modern Japanese military history is largely defined not by wars with other states, but by internal conflicts. This period is marked by the departure from relatively small or medium-sized clan-like battles, to massive clashes of clans for battle over the control of Japan. In the Kamakura period, Japan successfully repulsed Mongol invasions and this started a huge growth to armies with samurai as an elite force and commanders. Following roughly fifty years of bitter fight over control of Imperial succession, the Muromachi period under the Ashikaga shogunate saw a brief period of peace as the power of the traditional systems of administration of the Court gradually declined. Later, the position of the provincial governors and other officials under the shogunate slowly gave way into a new class of daimyo (feudal lords), and thus, bringing the archipelago into a period of 150 years of fractious disunity and war. The Samurai Suenaga facing Mongols, during the Mongol invasions of Japan. Mōko Shūrai Ekotoba (蒙古襲来絵詞), circa 1293. Having subdued their rivals, the Taira clan, the Minamoto clan established the Kamakura shogunate, which brought a period of peace. The only battles fought during this period mainly consisted of agents of the Minamoto suppressing rebellions or similar. The Mongols, who controlled China at the time under the Yuan Dynasty, attempted to invade Japan twice in the 13th century, marking the important military event of the Kamakura period, and two of the very few invasion attempts upon Japan. In early October 1274, the Battle of Bun'ei began with a combined force of Mongols and Koreans seizing Tsushima, and then attacking Kyūshū, landing at Hakata Bay. On October 19, the Mongols lost many battle ships due to typhoon and the remaining troops retreated. Anticipating a second assault, the shogunate organized the construction of walls and fortresses along the shore, and gathered forces to defend against further invasions. A second invasion attempt was made in 1281, in what has come to be known as the Battle of Kōan; the Mongol-led forces retreated after losing many ships again due to a typhoon. The equipment, tactics, and military attitudes of the samurai and their Mongol opponents differed greatly, and while both invasions failed miserably, their impact on developments and changes in samurai battle were quite significant. The samurai remained attached to ideas of single combat, that of honorable battle between individual warriors, and to certain ritual elements of battle, such as a series of archery exchanges conducted before entering into hand-to-hand fighting. The Mongols, of course, knew nothing of Japanese conventions, and were arguably much more organized in their strike tactics. They did not select individual opponents with whom to conduct honorable duels, but rode forth on horseback, with various forms of gunpowder weapons and the now-famous Mongol bow, charging into enemy lines and killing as many as they could without regard to Japanese conceptions of protocol. Though archery and mounted combat were central to Japanese warfare as well at this time, the Mongols remain famous even today for their prowess in these matters. The ways samurai tactics and attitudes were affected directly by these experiences, and their extent, are of course difficult to ascertain, but were certainly significant. The shogunate fell in the wake of the 1331 Genkō War, an uprising against the shogunate organized by the Emperor Go-Daigo. After a brief period under true Imperial rule, the Ashikaga shogunate was established in 1336, and a series of conflicts known as the Nanboku-chō Wars began. For over fifty years, the archipelago became embroiled in disputes over control of Imperial succession, and thus over the country. Battles grew larger in this period, and were less ritualized. Though single combats and other elements of ritual and honorable battle remained, organized strategies and tactics under military commanders began to emerge, along with a greater degree of organization of formations and divisions within armies. It was in this period as well that weaponsmithing techniques emerged creating so-called "Japanese steel" blades, flexible yet extremely hard and sharp; the katana, and myriad similar or related blade weapons, appeared at this time and would dominate Japanese arms, relatively unchanged, through the mid-20th century. As a result, it was also during this period that the shift of samurai from archers to swordsmen began in a significant way. Less than a century after the end of the Nanboku-chō Wars, peace under the relatively weak Ashikaga shogunate was destroyed by the outbreak of the Ōnin War, a roughly ten-year struggle that converted the capital of Kyoto into a battlefield and a heavily fortified city that suffered severe destruction. The authority of both the shogunate and the Imperial Court had all but weakened, and provincial Governors (shugo) and other local samurai leaders emerged as the daimyo, who would battle each other, religious factions (e.g. the Ikkō-ikki) and others for land and power for the next 150 years or so. The period has come to be called Sengoku (戦国), after the Warring States period in ancient Chinese history. Over one hundred domains clashed and warred throughout the archipelago, as clans rose and fell, boundaries shifted, and some of the largest battles in all of global pre-modern history were fought. A great many developments and significant events took place during this period, ranging from advances in castle design to the advent of the cavalry charge, the further development of campaign strategies on a grand scale, to the significant changes brought on by the introduction of firearms. Army compositions changed and grew more strategic; masses of ashigaru footsoldiers, armed with long lances (yari) served a role alongside mounted samurai, archers, and later, gunners. Siege tactics and weaponry were exceedingly rare until the modern era. Naval battles likewise consisted of little more than using boats to move troops within range of bow or arquebus, and then into hand-to-hand fighting. The Hōjō clan, in and around the Kantō area, were among the first to establish networks of satellite castles, and the complex use of these castles both for mutual defense and coordinated attacks. The Takeda, under Takeda Shingen, developed the Japanese equivalent of the cavalry charge; though debate continues today as to the force of his charges, and the appropriateness of the term, comparing them to Western cavalry charges, it is evident from contemporary sources that it was a revolutionary development, and powerful against defenders unused to it. Battles of particular interest or significance are too numerous to list here, but suffice it to say that this period saw a myriad of strategic and tactical developments, and some of the longest sieges and largest battles in the history of the pre-modern world. 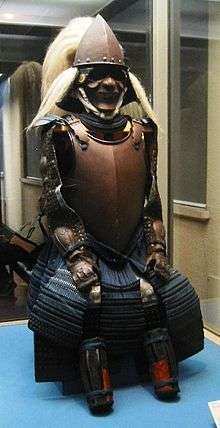 Nanban (Western)-style samurai cuirass, 16th century. This period, named for the increasingly important castle-cities, is marked with the introduction of firearms, after contact with the Portuguese, and a further push towards all-out battle, away from individual combats and the influences of concepts of personal honor and bravery. The arquebus was introduced to Japan in 1543, by Portuguese on board a Chinese ship that crashed upon the tiny island of Tanegashima in the southernmost parts of the Japanese archipelago. Though their introduction was not seen to have particularly dramatic effects for several decades, by the 1560s, thousands of gunpowder weapons were in use in Japan, and began to have revolutionary effects upon Japanese battle tactics and strategies, army compositions, and castle architecture. The 1575 Battle of Nagashino, in which about 3,000 arquebusiers led by Oda Nobunaga cut down charging ranks of thousands of samurai, remains one of the chief examples of the effect of these weapons. Highly inaccurate, and taking a long time to reload, arquebusses, or teppō (ja:火縄鉄砲) as they are called in Japanese, did not win battles on their own. Oda Nobunaga, Toyotomi Hideyoshi, and other commanders, developed tactics that honed arquebus use to the greatest advantage. At Nagashino, Nobunaga's gunners hid behind wooden barricades, embedded with large wooden spikes to ward off cavalry, and took turns firing volleys and reloading. As in Europe, the debilitating effects of wet (and therefore largely useless) gunpowder were decisive in a number of battles. But, one of the key advantages of the weapon was that unlike bows, which required years of training largely available only to the samurai class, guns could be used by relatively untrained footmen. Samurai stuck to their swords and their bows, engaging in cavalry or infantry tactics, while the ashigaru wielded the guns. Some militant Buddhist factions, began to produce firearms in the foundries normally employed to make bronze temple bells. In this manner, the Ikkō-ikki, a group of monks and lay religious zealots, turned their Ishiyama Honganji cathedral-fortress into one of the most well-defended fortresses in the country. The ikki and a handful of other militant religious factions thus presented significant powers unto themselves, and fought fierce battles against some of the chief generals and samurai clans in the archipelago. Though Sengoku battles continued to rage as they had for the previous century, growing larger and more tactically complex, it was at this time that the many "warring states" began to be united, first under Oda Nobunaga, then under Toyotomi Hideyoshi, and finally by Tokugawa Ieyasu. Between 1592 and 1598, Toyotomi Hideyoshi organized an army of 150,000 soldiers for the conquest of China's Ming Dynasty by way of Korea, after the latter's refusal to allow Japanese forces to march through. Japan completed the occupation of the Korean peninsula in three months. However, a Chinese army was sent to Korea at the behest of the Korean king. Eventually, the supply lines of the Japanese army became overstretched until it became impossible for the Japanese army to maintain the occupation of the Korean peninsula. After Hideyoshi's death, the Council of Five Elders ordered the remaining Japanese forces in Korea to retreat. Tokugawa Ieyasu, one of the regents, took control of most of the former leader's forces. In 1600, he won the battle of Sekigahara and solidified his rule. In 1603, he received the title of shogun, making him the nominal ruler of the entire country. This period was one of relative peace under the authority of the Tokugawa shogunate. This was a forced peace—maintained through a variety of measures that weakened the daimyo and ensured their loyalty to the shogunate. The Tokugawa peace was ruptured only rarely and briefly prior to the violence that surrounded the Meiji Restoration of the 1860s. The Siege of Osaka, which took place in 1614–1615, was essentially the last gasp for Toyotomi Hideyori, heir to Hideyoshi, and an alliance of clans and other elements who opposed the shogunate. A samurai battle on a grand scale, in terms of strategy, scale, methods employed, and the political causes behind it, this is widely considered the final conflict of the Sengoku period. Outside of the siege of Osaka, and the later conflicts of the 1850s-60s, violence in the Edo period was restricted to small skirmishes in the streets, peasant rebellions, and the enforcement of maritime restrictions. Social tension in the Edo period brought a number of rebellions and uprisings, the largest of which was the 1638 Shimabara Rebellion. In the far north of the country, the island of Hokkaido was inhabited by Ainu villagers and Japanese settlers. In 1669, an Ainu leader led a revolt against the Matsumae clan who controlled the region, and it was the last major uprising against Japanese control of the region, and was put down in 1672. In 1789, another Ainu revolt, the Menashi-Kunashir Rebellion, was crushed. The appearance of gunboat diplomacy in Japan in the 1850s, and the forced so-called "opening of Japan" by Western forces underscored the weaknesses of the shogunate and led to its collapse. Though the actual end of the shogunate and establishment of an Imperial government with Western style was handled entirely peacefully, through political petitions and other methods, the years surrounding the event were not entirely bloodless. Following the formal termination of the shogunate, the Boshin War (戊辰戦争 Boshin Sensō, literally "War of the Fifth Year of Year of the Yang Earth Dragon") was fought in 1868-1869 between the Tokugawa army and a number of factions of nominally pro-Imperial forces. After a long period of peace, Japan rearmed by importing, and then manufacturing Western weapons, and finally manufacturing weapons of Japanese design. During the Russo-Japanese War (1904–1905), Japan became the first modern Asian nation to win a war against a European nation. In 1902, it became the first Asian nation to sign a mutual defense pact with a European nation, Britain. Japan was also the last major power to enter the race of global colonization. Severely hampered by its still-developing industries, Japan started a war against the United States during World War II with less than one-tenth of the industrial capabilities of the US. Even though Japan stills maintains a powerful defense force today, its Constitution originally drawn under the guidelines of General Douglas MacArthur in 1945 formally renounces war and the use of military force in aggressive ways. Japan also maintains a policy against the exporting of military hardware. In September 2015, the Liberal Democratic Party under the leadership of Prime Minister Shinzo Abe, reinterpreted the Constitution allowing Japan to use military force in assistance of its allies. The legality of these changes has been questioned by many academics and citizens. The first French military mission to Japan (1867–1868). From 1867, Japan requested various Western military missions in order to help Japan to modernize its armed forces. 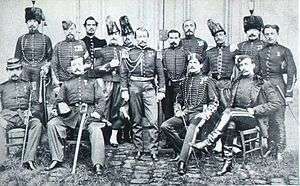 The first foreign military mission in Japan was held by France in 1867. Captain Jules Brunet, initially a French artillery advisor of the Japanese central government, eventually took up arms alongside the Shogun's army against the Imperial troops during the Boshin War. His life inspired the movie The Last Samurai, starring Tom Cruise and Ken Watanabe. In 1873, the Imperial government enacted the conscription law and established the Imperial Japanese Army. As class distinctions were all but eliminated in attempts to modernize and create a representative democracy, samurai lost their status as the only class with military privileges. 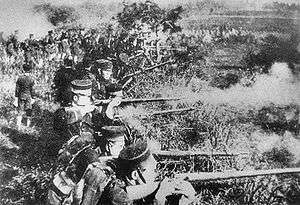 Japanese troops during the First Sino-Japanese War. The Sino-Japanese War was fought against the forces of the Qing Dynasty of China in the Korean peninsula, Manchuria, and the coast of China. It was the first major conflict between Japan and an overseas military power in modern times. The Treaty of Shimonoseki (下関条約, Shimonoseki Jyoyaku) signed between Japan and China ended the war. Through this treaty, Japan forced China to open ports for international trade and ceded the southern portion of China's Liaoning province as well as the island of Taiwan to Japan. China also had to pay a war indemnity of 200 million Kuping taels. As a result of this war, Korea ceased to be a tributary state of China, but fell into Japan's sphere of influence. However, many of the material gains from this war were lost by Japan due to the Triple Intervention. The Japanese occupation of Taiwan was strongly resisted by various interests on the island, and was only completed after a full-scale military campaign requiring the commitment of the Imperial Guards Division and most of the 2nd and 4th Provincial Divisions. The campaign began in late May 1895 with a Japanese landing at Keelung, on the northern coast of Taiwan, and ended in October 1895 with the Japanese capture of Tainan, the capital of the self-styled 'Republic of Formosa'. The Japanese defeated regular Chinese and Formosan formations relatively easily but their marching columns were often harassed by guerilla formations. The Japanese responded with brutal reprisals, and sporadic resistance to their occupation of Taiwan continued until 1902. The Japanese victory in the Russo-Japanese War of 1904-1905 marks the emergence of Japan as a major military power. Japan demonstrated that it could apply Western technology, discipline, strategy, and tactics in an effective war. In 1914, Japan was a member of the Allies during World War I and was rewarded with control of German colonies in the Pacific. The 70,000 strong Japanese force also intervened in Russia during the Russian Civil War, supporting the anti-Communist factions, but failed to achieve their objective and was forced to withdraw. A small group of Japanese cruisers and destroyers also participated in various missions in the Indian Ocean and Mediterranean Sea. Already controlling an area directly surrounding the South Manchuria Railroad, Japan's Kwantung Army further invaded Manchuria (Northeast China) in 1931, following the Mukden Incident, in which they claimed to have had territory attacked by the Chinese (a few meters of the South Manchuria Railway was damaged in an explosion caused by dynamite). By 1937, Japan had annexed territory north of Beijing and, following the Marco Polo Bridge Incident, a full-scale invasion of China began. Japanese military superiority over a weak and demoralized Chinese Republican army allowed for swift advances down the eastern coast, leading to the fall of Shanghai and Nanjing (Nanking, then capital of the Republic of China) the same year. The Chinese suffered greatly in both military and civilian casualties. An estimated 300,000 civilians were killed during the first weeks of Japanese occupation of Nanjing, during the Nanking Massacre. In September 1940, Germany, Italy, and Japan became allies under the Tripartite Pact. Germany, which had previously trained and supplied the Chinese army, halted all Sino-German cooperation, and recalled its military advisor (Alexander von Falkenhausen). In July 1940, the U.S. banned the shipment of aviation gasoline to Japan, while Imperial Japanese Army invaded French Indochina and occupied its naval and air bases in September 1940. In April 1941, the Empire of Japan and the Soviet Union signed a neutrality pact and Japan increased pressure on the Vichy French and Dutch colonies in Southeast Asia to cooperate in economic matters. Following Japan's refusal to withdraw from China (with the exclusion of Manchukuo) and Indochina, United States, Great Britain and Netherlands imposed, on July 22, 1941, an embargo on gasoline while shipments of scrap metal, steel and other materials had virtually ceased. Meanwhile, American economic support to China began to increase. Following the Japanese attack on Pearl Harbor and against several other countries on December 7, 1941, the United States, United Kingdom and the other Allies declared war; the Second Sino-Japanese War became part of the global conflict of World War II. Japanese forces initially experienced great success against Allied forces in the Pacific and South East Asia, capturing Thailand, Hong Kong, Malaya, Singapore, the Dutch East Indies, the Philippines and many Pacific Islands. They also made major offensives in Burma and air and naval attacks against Australia. The Allies turned the tide of war at sea in mid-1942, at the Battle of Midway. Japanese land forces continued to advance in the New Guinea and Solomon Islands campaigns but suffered significant defeats and/or were forced to retreat at the battles of Milne Bay, the Kokoda Track and Guadalcanal. The Burma campaign turned as the Japanese forces suffered catastrophic losses at Imphal and Kohima, leading to the greatest defeat in Japanese history up to that point. From 1943 onwards, hard-fought campaigns at the battles of Buna-Gona, the Tarawa, Philippine Sea, Leyte Gulf, Iwo Jima, Okinawa, and others resulted in horrific casualties, mostly on the Japanese side, and produced further Japanese retreats. Very few Japanese ended up in POW camps. This may have been due to Japanese soldiers' reluctance to surrender. The brutality of the conflict is exemplified by US troops taking body parts from dead Japanese soldiers as "war trophies" or "war souvenirs" and Japanese cannibalism. Throughout the Pacific War, the Japanese military engaged in war crimes, in particular the mistreatment of prisoners of war and civilians. Some estimate that around 6 million people were killed by Japanese forces, primarily Chinese civilians. These numbers are disputed given that between 1939–1945, more than 16 million civilians were injured in China alone. This was the largest civilian casualty count in any country. Mistreatment of Allied prisoners of war through forced labour and brutality received extensive coverage in the west. It is widely perceived that the Japanese government has failed to acknowledge the suffering caused by its forces and in particular the teaching of history in its schools has caused international protest. On August 6 and August 9, 1945, the U.S. dropped two atomic bombs on Hiroshima and Nagasaki. An estimated 150,000-246,000 people died as a direct result of these two bombings, during which the Soviet Union entered the war against Japan. 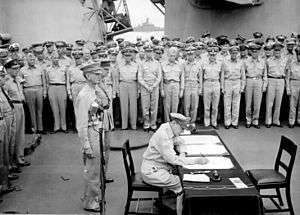 Japan surrendered on August 15, 1945 and a formal Instrument of Surrender was signed on September 2, 1945, on the battleship USS Missouri in Tokyo Bay. The surrender was accepted by General Douglas MacArthur as Supreme Allied Commander, with representatives of each Allied nation, from a Japanese delegation led by Mamoru Shigemitsu. A separate surrender ceremony between Japan and China was held in Nanking on September 9, 1945. Following this period, MacArthur established bases in Japan to oversee the postwar development of the country. This period in Japanese history is known as the Occupation. U.S. President Harry Truman officially proclaimed an end of hostilities on December 31, 1946. Over the course of the war, Japan displayed many significant advances in military technology, strategy, and tactics. Among them were the Yamato-class battleship, the Sen-Toku submarine bomber carriers, the Mitsubishi Zero fighters, and Kamikaze bombers. After a period of U.S. occupation (1945–1952), Japan regained its independence. Japan is also forbidden to have a military and to wage war by Article 9 of its Constitution, although in 1954, the Japan Self-Defense Forces was created with standing armies, modern weapons and material. As Japan perceived a growing external threat without adequate forces to counter it, the National Safety Forces underwent further development that entailed difficult political problems. The war renunciation clause of the constitution was the basis for strong political objections to any sort of armed force other than conventional police force. In 1954, however, separate land, sea, and air forces for purely defensive purposes were created, subject to the command of the Prime Minister. The armed forces consist of the Ground Self-Defense Force (GSDF), the Maritime Self-Defense Force (MSDF), and the Air Self-Defense Force (ASDF). The JSDF is one of the most technologically advanced armed forces in the world and Japanese military expenditures are the seventh highest in the world. Though the Treaty of Mutual Cooperation and Security, signed in 1960, allows for the continued presence of American military bases in Japan, most of them on Okinawa, no formal agreement was ever set by which Japan officially relies on the United States, United Nations, or anybody else for its defense. In the aftermath of the Occupation, attempts were made by some administrations in Japan, particularly at the urging of the United States, to amend the Constitution to rearm. This was prevented by intense popular sentiment against this action, and against war in general, along with the attitudes and agendas of significant elements within the government. In 1967, Prime Minister Eisaku Satō outlined the Three Non-Nuclear Principles by which Japan stands against its production, or possession of nuclear weaponry. Similar ideas were expressed several years later against the production and export of conventional arms. For the time being, Japan has deployed the JSDF to aid in a number of non-combat missions, especially those involving humanitarian aid, such as aiding the victims of the 1995 Kobe earthquake, providing administrative support to the United Nations Interim Force In Lebanon (UNIFIL) Norwegian Battalion (NORBATT) in the 1990s, and helping rebuild Iraq. Some Japanese people had stated a desire to have their own military due to fear of the growing power of China and the hostility of North Korea. They claim that the U.S. has failed to properly address these issues, and Japan must grant itself what they mean is the power to adequately defend itself. In 2004, then-United Nations Secretary General Kofi Annan announced a plan to expand the number of permanent seats on the United Nations Security Council, and Japan seeks to gain one of those seats. Despite Japan's economic power and political influence, some debate whether or not a country with no "official" standing military can be considered a "world power" that should have a permanent seat on the Council. Recent disputes with neighboring countries over territories such as the Senkaku Islands, Liancourt Rocks, and the Kuril Islands, as well as accusations of Japanese whitewashing of history in various textbook controversies, have also complicated this process. ↑ A Military History of Japan by John Kuehn page 5. ↑ "Japan's Korea War: First Invasion (1592-1596) - New World Encyclopedia". www.newworldencyclopedia.org. ↑ "Imphal and Kohima". National Army Museum. Retrieved 2015-02-06. ↑ Mariko Oi (14 March 2013). "What Japanese history lessons leave out". BBC. Retrieved 2015-02-06. ↑ "Japan textbook angers neighbours". BBC. 3 April 2001. Retrieved 2015-02-06. ↑ "Frequently Asked Questions". Radiation Effects Research Foundation. Retrieved March 6, 2014. Morton, Louis (1960). "Japan's Decision for War". In Kent Roberts Greenfield. Command Decisions (= 2000 ed.). United States Army Center of Military History. CMH Pub 70-7. Harries, M. and S. Harries. Soldiers of the Sun: The Rise and Fall of the Imperial Japanese Army (1991). Lone S. Japan's First Modern War: Army and Society in the Conflict with China, 1894-95 (1994). Turnbull, The Samurai: A Military History New York: Macmillan, 1977. Turnbull, Stephen (2002). War in Japan: 1467-1615. Oxford: Osprey Publishing. 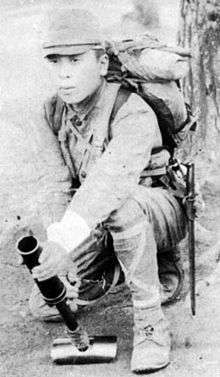 Wikimedia Commons has media related to Military history of Japan.